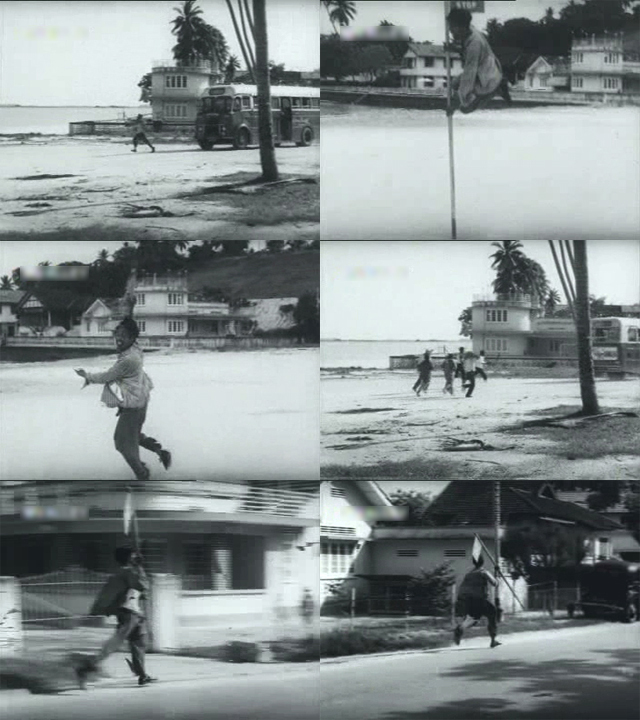 The previous two parts on the film locations featured in Usmar Ismail’s “Korban Fitnah” have focused on the opening sequence of the film and covered places such as the Outram Prison, Pearl’s Hill, the Police Courts and Hong Lim Park. The final two parts of the “Korban Fitnah” series will present the remaining locations in Singapore featured in the film (some of which are no longer around), such as the Tanjong Pagar Railway Station, seaside restaurants along Upper East Coast Road, C.K. Tang, former East Coast beach and promenade, a Malay fishing village, Joo Chiat Police Station, Singapore Hotel, and the General Hospital. All the scenes and locations hereafter are recalled by Hussein in the film narrative as a long flashback sequence. (You may read the film synopsis in Part 1 of the “Korban Fitnah” series.) The locations listed here below and in the next post are also presented in order of appearance in the film/flashback. 4. A Typical Bus Stop in the Suburbs, 1950s. Hussein’s brother, Hassan, returns home from work by bus. He alights at a bus-stop which has a design typical of bus-stops in the Singapore suburbs during the 1950s — a simple zinc/tin roof shelter with safety barriers. Hussein was studying in Kuala Lumpur. After his final exams, he returns via train to Singapore where his family lives. He is also eager to meet his newly-wed brother and sister-in-law. This sequence from the film shows a Malayan Railway (MR) 20-class diesel-electric train from Kuala Lumpur pulling into the Tanjong Pagar Railway Station in Singapore. 6. Wyman’s Haven Restaurant (惠文港酒家) along Upper East Coast Road. 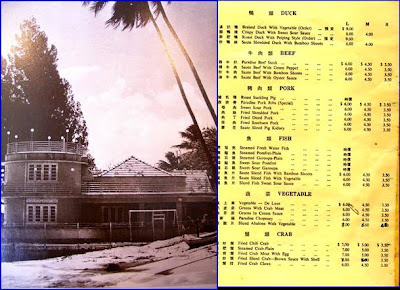 The “Wyman’s Haven” Restaurant (惠文港酒家) was a Chinese restaurant housed in a large seafront bungalow on the east coast of Singapore popular in the 1950s. 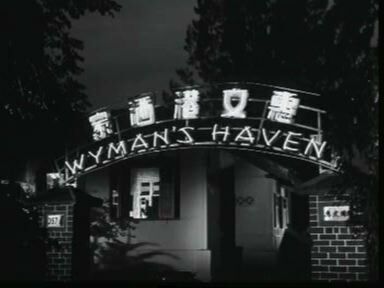 According to Peter Chan, a guest blogger at Lam Chun See’s “Good Morning Yesterday” blog, “Wyman’s Haven” was owned by his maternal grandmother and it was built in the 1930s with extensions made in the 1950s. He also provided images of the exterior of the restaurant and the menu, and recalled that he would sit on the seawall outside the bungalow whilst waiting for his favourite roasted pigeon (烧乳鸽) to be ready. From old newspaper records, I gathered that “Wyman’s Haven” was a popular dining place for sports clubs, associations and companies to host dinners and picnics for their members and staff. 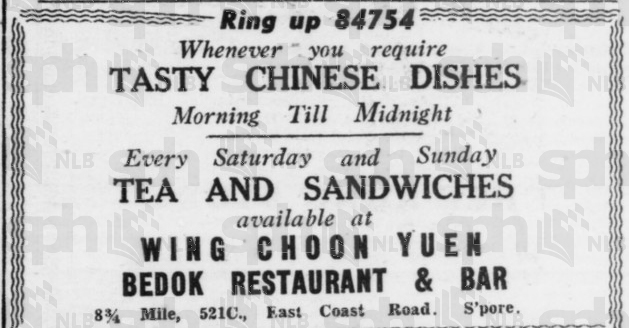 The restaurant ran many advertisements in the Straits Times during the late 1950s. One of them went like this: “WYMAN’s HAVEN welcome you to dine in the spacious lawn by the sea, the traditional Chinese New Year dishes, drink the best wine and dance to the lilting Hawaiin music of the ‘Pahidians’ on Chinese New Year’s Eve and night – 17th and 18th February. Address 357A, Upper East Coast Road 8 1/4 m.s. Tel: 44310.” (The Straits Times, 12 February 1958, Page 15.) Another in the classifieds would claim that “WE SERVE SPECIAL Chinese delicacies. Wyman’s Haven, Bedok, Tel: 44310.” (The Straits Times, 10 February 1959, Page 14). For all you know, the sequence featuring Wyman’s Haven in the film could have been a paid product placement. 1st row right: The three main protagonists of the film in the middle; from left: Hassan, Rahimah and Hussein. The seafront restaurant’s business dwindled in the early 1960s due to land reclamation projects along the east coast of Singapore. The idyllic setting of the restaurant was drastically done away with and Wyman’s Haven probably closed down in the 1970s as result of that. On the former restaurant’s site now are a few semi-detached houses (Nos.580-590, Upper East Coast Road) and the entrance to Temasek Secondary School. The bungalow with the cylindrical design housed the “Wyman’s Haven” Restaurant. It became a “desert-front” restaurant in the 1960s due to surrounding land reclamation works. Make a guess as to what dear Mr. Mat Sentul is up to running around with the bus-stop pole. I will write about the film and the locations featured in it in a later post soon. Back to “Korban Fitnah”, I also wish to point out here that both of the songs performed by the artistes and the band in the restaurant are Indonesian by origin, and it’s probably not by coincidence that the film director Usmar Ismail and the three main actors of the film are all Indonesians — Hussein [acted by Sukarno M. Noor]; Rahimah [acted by Maria Menado, who also produced the film]; and Hassan [acted by A.N. Alcaff]. And the sequence ends off with diners in kebayas and lounge suits dancing and yelping to a (Irish?) fiddle number…. All of these shot on location in a Singapore Chinese restaurant, with extras acting as diners and revelers from a multi-racial, multi-national cast. This may truly be an early “international-regional” film from Singapore par-excellence! 7. C.K. Tang Department Store, Orchard Road. Upon receiving his first paycheck, Hussein brings his sister-in-law Rahimah along to shop for presents for his brother at C.K. Tang in Orchard Road. Is this perhaps another brand placement in the film? In 1958 (a year before “Korban Fitnah”), the C.K. 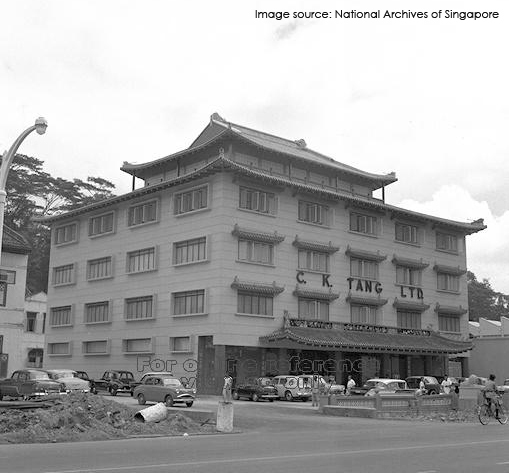 Tang Department Store was built along Orchard Road by Tang Choon Keng, a Singaporean visionary entrepreneur. It was then the first major retail venue in the vicinity. The now-well-known Orchard Shopping Belt has its earliest beginnings in this Chinese-roofed four-storey building modeled after the Imperial Palace in Beijing. From the National Archives. C.K. Tang Department Store along Orchard in 1959. It was demolished in 1982 to make way for the new Tang complex which comprised of a hotel and a large shopping mall. Hussein and Rahimah have time to spare. More shopping at smaller retail outlets. Specific location unknown. Could be Orchard Road. Film-stills from “Korban Fitnah”. Rahimah goes shopping in an open-air nursery. Specific location unknown. Probably in the eastern part of Singapore, where most of this film was shot. 9. Bedok Restaurant & Hoi Meng Yuen Restaurant (海明苑酒家?) along Upper East Coast Road. Wahab, Hussein’s room-mate in Kuala Lumpur, is in Singapore to visit him. However, he is punched in the face by Hussein for taking an unacceptable interest in Rahimah and furthermore, stalking her. A deceitful Wahab, wanting to seek revenge, sits down with Hassan at Bedok Restaurant and conjures up lies to convince Hassan that his brother and his wife are having an affair behind his back. Hassan believes in Wahab’s white lies and is devastated. 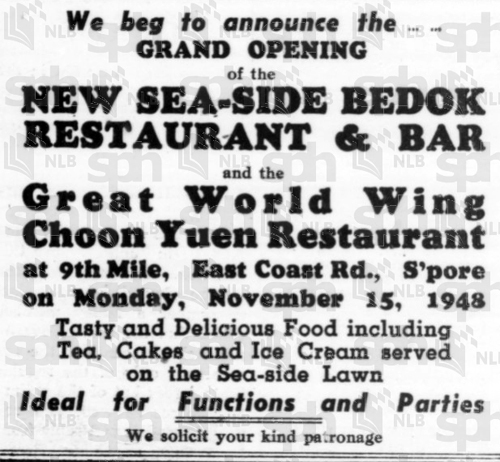 Bedok Restaurant happened to be another popular seaside restaurant (other than Wyman’s Haven) situated along the East Coast in the 1950s. No other images of the restaurant can be found online or in books. 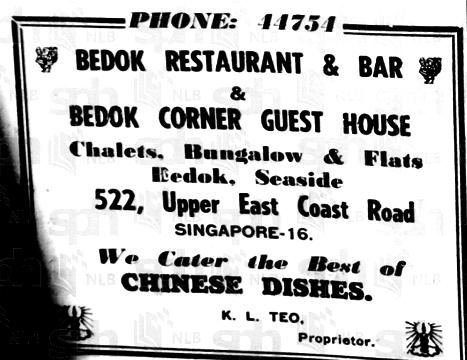 However, a search in the newspaper archives uncovered bits of information related to the Bedok Restaurant. 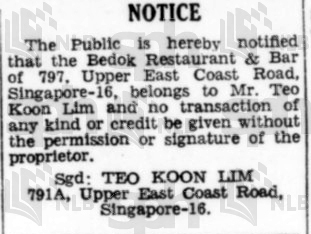 It seems that a Mr. Teo Koon Lim owned the restaurant, of which the official address was 521C, Upper East Coast Road (The Straits Times 25 November 1955, Page 12). 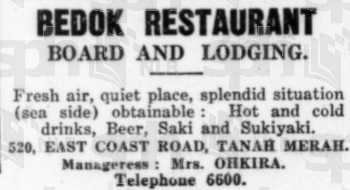 Ads in the Straits Times Classified were regular, and one of them went: “DRINK, DINE on verandah opposite sea, Bedok Restaurant, Telephone 447547.” (Straits Times 30 June 1957, Page 21). Indeed, the film sequence showing Hassan and Wahab at the restaurant were indeed shot on a verandah. Extracted from the Singapore National Library’s “NewspaperSG” website. The Strait Times 17 April 1928, Page 5. The Strait Times 8 October 1936, Page 2. The Strait Times 13 November 1948, Page 5. The Strait Times 23 December 1949, Page 3. The Strait Times 8 March 1957, Page 13. The Strait Times 17 December 1957, Page 13. The Strait Times 31 December 1963, Page 15. Bedok Restaurant probably suffered the same fate as Wyman’s Haven and closed down after land reclamation works moved the seafront outwards — that which led to the demise of many seaside restaurants in the vicinity. “Korban Fitnah” and its film crew probably saw their last days of popular existence. Despite the closure of the Bedok restaurant, part of the bungalow housing the restaurant and guest house still remains to this day. I paid a visit to the plot of land at No.797 Upper East Coast Road and discovered that the base of the house and the staircase to the verandah has been conserved. The owner is redeveloping the site and building a new structure over the original base of Bedok Restaurant. Where Hassan and Wahab from “Korban Fitnah” walked up to engage in lies and deceit over soft drinks. 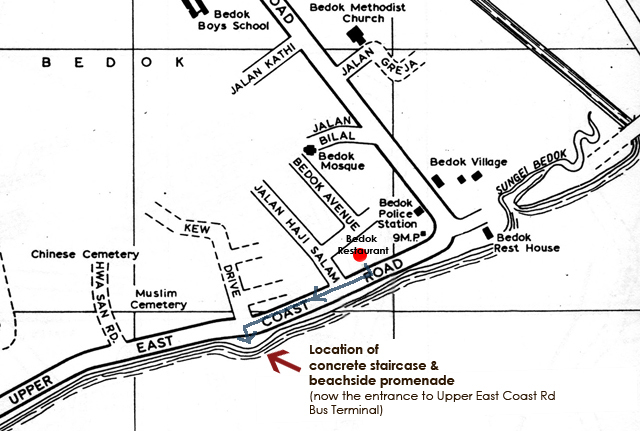 1963 map of the Bedok Corner. The red circle marks out the location of the former Bedok Restaurant. 10. Promenade by the sea, along (Upper) East Coast Road. The concrete staircase and promenade opposite Kew Drive. The beachside promenade opposite Kew Drive. Upper East Coast Road, near Bedok Corner, July 1959. 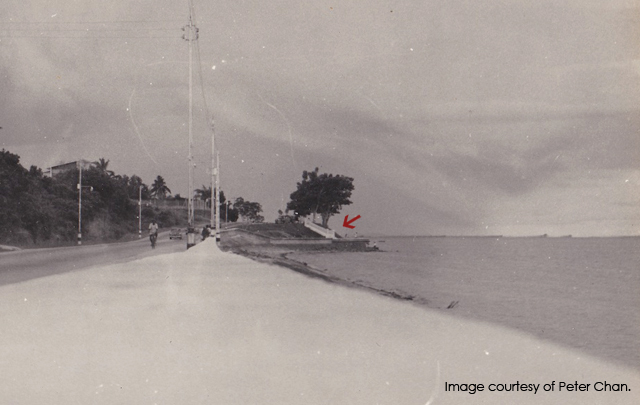 The red arrow points out the concrete staircase that Hassan used in “Korban Fitnah” to go to the promenade. A place one would go to think things through. This post is Part 3. This entry was posted in 1950s, Cathay-Keris, Malay-language Films, Narrative Feature Films, Singapore Architecture, Singapore History, Singapore-produced and tagged 1959, 20-class diesel-electric locomotive, bedok, bedok corner, bedok corner guest house, bedok restaurant, bengawan solo, bus stop, c.k. tang, cathay keris, east coast beach, east coast promenade, east coast road, 華友園, 詠春園酒家, hoi meng yuen restaurant, Hua Yu Wee, indonesia, Jalan Haji Salam, korban fitnah, ktm, kuala lumpur, land reclamation, malay film, malayan railway, maria menado, mat 3/4, mat sentul, mat tiga suku, nursery, orchard road, outhouse, pahidians, seafront bungalow, singapore, suburb, tanjong pagar railway station, tanjong pagar train station, temasek secondary school, upper east coast road, usmar ismail, victim of slander, Wing Choon Yuen Restaurant, Wyman's Haven, 惠文港酒家, 海明苑酒家. I know the location of the promenade. Now the entrance to Upper East Coast Road bus terminus/opposite Kew Drive. 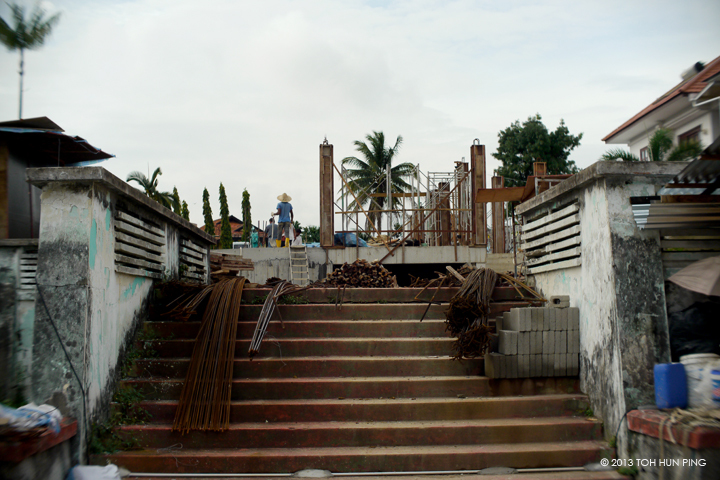 There werew 2 concrete staircases leading to a jetty with a small concrete bdlg. Thanks for your still pics which now further bring back memories to me. Peter, thanks for your inputs! 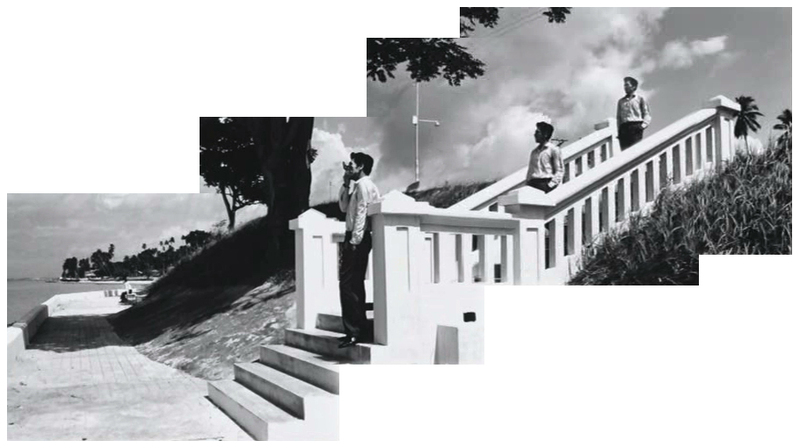 So, the staircase and promenade in the film were indeed within stone’s throw from Bedok Restaurant. And there was even a jetty? Are there photos of the jetty and the concrete building I can refer to? Very interesting blog esp. on a few Malay classic film from the 60’s. Really appreciate if you got time and resources to do some more findings from the foll. Malay Movies. Menyerah (1956), Serangan Orang Minyak (1958), Che Mamat Parang Tumpol (1960), Sumpitan Rachun (1961), Rumah Itu Dunia Aku (1963) and Kaseh Ibu (1965). There are many interesting places around Singapore that might be forgotten or no longer exist. Many of this film can be view from youtube. Thank you. I do have intentions to work on blogposts for “Menyerah” (with locations such as the Outram Prison and Paya Lebar Police Station) and “Sumpitan Rachun” (with the former Cathay Building) in the near future. Your Latifah Omar blog is fantastic as well. Will serve as a good resource for me in the near future. And I was wondering if I can get some help from you with regards to the dialogue in the films, specifically “Sumpitan Rachun”, as I’m writing a short article about the film for a book. I’m a beginner-learner of Bahasa Melayu, but is not yet proficient enough to understand what the characters in the film are saying. Can I email you further with regards to a possible collaboration? Wow….what a fantastic reply from you Hun Ping. Good news for me and for all Classic Malay Film enthusiasts that you are making more findings on the location shot from the film “Menyerah” and “Sumpitan Rachun”. Sumpitan Rachun is a very interesting crime buster movie directed by Tan Sri L Krishnan (Father of Malay Movies) with the film script written by Pelham Groom (Englishman). On my part I have no problem to assist you in the film translations . Yes please e-mail me if you need any help. Many thanks & regards. Really really want to see Korban Fitna, may u tell me how to watch / obtain it ?